Upright brome is a medium tall perennial grass, which as its name suggests has stiff upright flowering stems with branched heads. These arise from basal tufts or tussocks of tough green rough leaves. Upright brome is a plant of dry, relatively infertile calcareous soils, becoming most frequent, and sometimes dominant, in ungrazed or undergrazed chalk and limestone grasslands. It is largely absent from wet or arable sites. Upright brome seed can be sown at any time of the year when soil conditions are suitable. 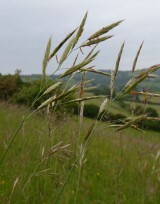 For such a robust grass upright brome can be surprisingly slow to germinate and establish from seed. Where it is used in mixtures in grassland restoration schemes on chalk or limestone it is usually sown with other companion grasses such as sheep's fescue to provide some initial ground cover. Once established however plants progressively add leaves, filling out and expanding to form tussocks, dominating the space they grow into. 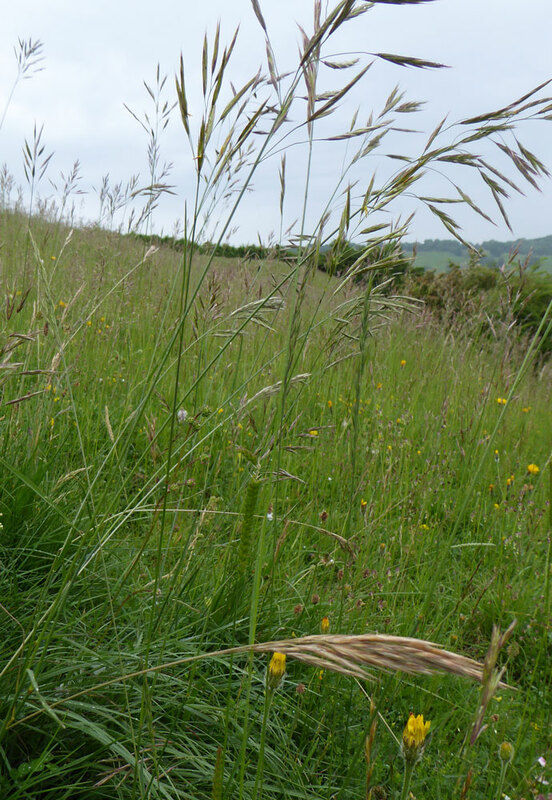 In the absence of good grassland management, of mowing or grazing, upright brome can expand and come to dominate grassland with its accumulated dense tussocks and leaf litter excluding low growing herbs and diversity. As a result it is a grass often associated with neglect and so viewed with Tor grass as a problem species. 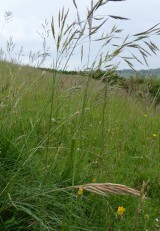 If well managed it is however possible to keep upright brome in balance within grassland. 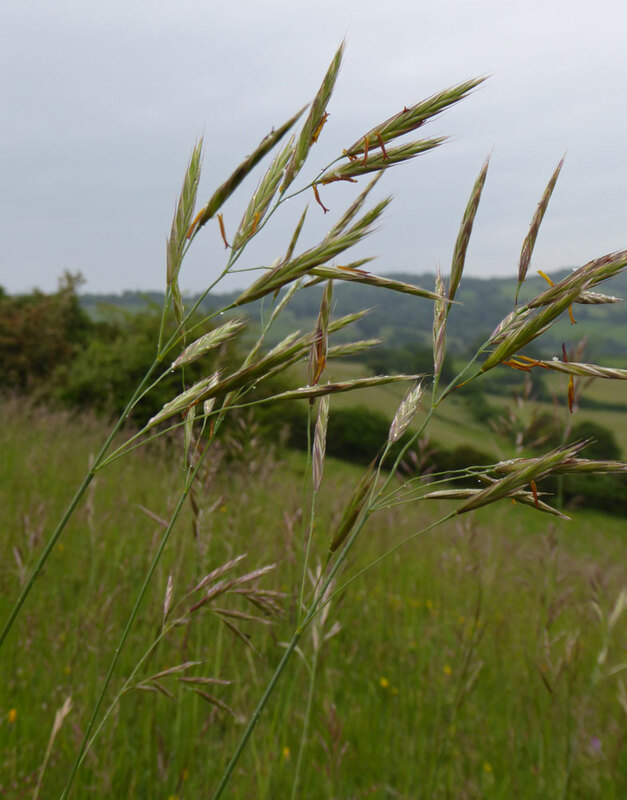 In spite of the coarse fibrous nature of upright brome its foliage is eaten by both livestock and by rabbits, so regular grazing can hold it in check or even help reverse its expansion following a period of neglect. The tussocks formed by upright brome are generally not as resistant to mowing by scythe as say tufted hairgrass; indeed the tussocks sometimes die out in their centre and expand out into a ‘fairy ring' of growth. Regular mowing of mixed swards containing upright brome is not usually difficult. Restorative mowing of long neglected litter-choked swards is likely to be more of a challenge for which it may be necessary to resort to bringing in a more powerful tractor mounted flail mower, or nibble a way through using a tough scythe blade or brush cutter. There is some experimental evidence to show that mowing the first flush of leaf growth in spring is particularly effective in checking the dominance of upright brome as it is subsequently slow to recover; whereas leaving the first cut until summer allows it to build up strength.